Fentanyl is a highly potent synthetic opioid analgesic with a rapid-onset and short duration. It is known to be 50 to 100 times more powerful and toxic than Morphine and 50 times stronger than Heroin. The drug's potency is so powerful that it has the proven potential to reach the brain within minutes, triggering respiratory failure. Fentanyl has historically been used for the treatment of pain and is commonly used as a pain reliever and anesthetic in combination with benzodiazepines in certain procedures. Open the sealed pouch by tearing along the notch. Remove the test device from the pouch. Hold one side of the device with one hand. Use the other hand to pull off the cap and expose the absorbent end. Lay the device flat on a clean, dry, non-absorbent surface. Read the result in 5 minutes. Do not read after 5 minutes. Fentanyl Currently Has Two Main Sources: The Pharmaceutical Companies And The Mexican Drug Cartels.� While Prices For Heroin Increase, The Demand For Fentanyl Goes Up And The Price Goes Down.� Addicts And Recreational Users Are Calling This The "Super Pill" Because It Is Being Sold On The Streets As Xanax, Or Other Benzodiazepines.� Drug Companies Are Taking This So-Called "Painkiller" And Using It To Put Profits Above People And Standards. While Fentanyl Is Only FDA approved For cancer patients with breakthrough pain, Those being referred for cancer-free reasons are skyrocketing. In its prescription form, Fentanyl is known as Actiq, Duragesic and Sublimaze. Street names for the drug include Apache, China girl, China white, dance fever, friend, goodfella, jackpot, murder 8, TNT, as well as Tango and Cash. 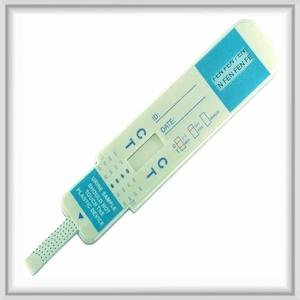 The designation of �for forensic use only� means that the substance abuse test is not FDA 510k Cleared.� These types of tests are successfully used by law enforcement, correction and probation departments.� This product is not intended to be used in the diagnosis, cure, mitigation, treatment, or prevention of disease or illness.